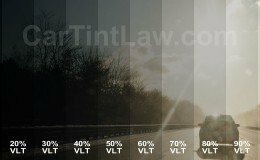 Our information on tint laws for various states is based on sources linked below, as well as our partnered traffic law experts. We do our very best to keep up with latest information, laws and legislation, but if you find an error you are welcome to contact us. Alabama Code Title 32, Chapter 5C: Window tinting and medical exceptions. Arizona Revised Statutes section 28-959.01: materials on windows or windshield. Idaho Statutes section 49-944. Standards for windshields and windows of motor vehicles — prohibited acts — penalty. Illinois Vehicle Code Chapter 12, Article V – Glass, Windshields, and Mirrors. Maryland Code section 22-406: Safety glazing material in motor vehicles. Massachusetts General Laws Chapter 90, Section 9D: Windshields and windows obscured by non-transparent materials. Michigan Vehicle Code section 257.709: Windshields and windows; prohibitions. Minnesota Statutes section 169.71: Windshield. Mississippi Code section 63-7-59: Windows and window glass generally. Nebraska Revised Statutes section 60-6, 257: Windshields and windows; tinting; sun-screening. Nevada Revised Statutes section 484.6195: Restrictions on tinting of windshield or side or rear window. New Hampshire Statutes section 266:58-a: Tinted glass. New Hampspire Tinted Windows Info. New Hampshire Medical Waivers Information. New Mexico Statutes section 66-3-846.1: Sun screening material on windshields and windows. Ohio Revised Code Section 4513.241: Using tinted glass and other vision obscuring materials. Rhode Island General Laws Chapter 31-23.3: Non-Transparent Windshields and Windows. South Dakota Codified Laws sections 32-15-1 through 32-15-15: Safety glass, non-transparent material on windows prohibited. Tennessee Code section 55-9-107: Motor vehicle windows with tinting, reflecting, or sun screen material. Vermont Statutes Title 23, section 1125: Obstructing windshields. Code of Virginia section 46.2-1053: Equipping certain motor vehicles with sun-shading or tinting films or applications. Revised Code of Washington section 46.37.430: Safety glazing – sunscreening or coloring.